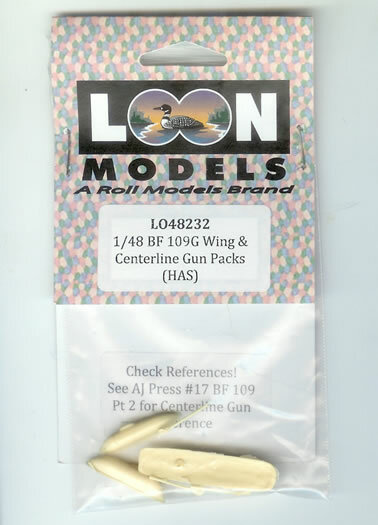 Bf 109 G Wing & Centerline Gun Packs for the Hasegawa kit. Poor detail on gun barrels, lack of gun-pack placement guide. Quite useable, but new gun barrels will be needed to get the best result in this scale. Referring to a comparatively obscure Polish book is no substitute for lack of placement guide or instructions. 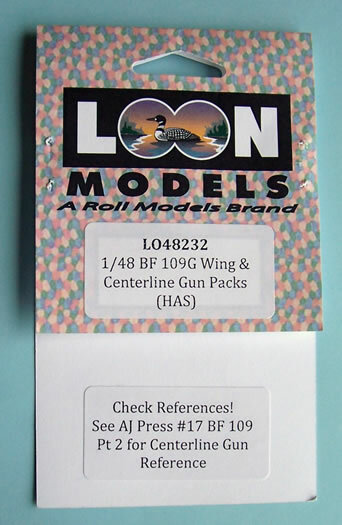 Loon is a house brand of Roll Models. 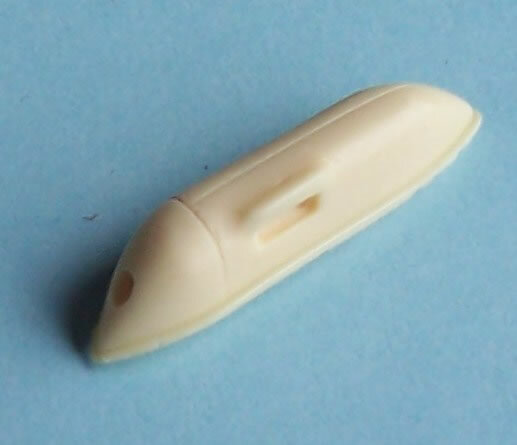 They offer a number of very useful detail, conversion and improvement sets in popular scales. The set comes in a zip-lock plastic bag stapled to a card header, and is intended for the Hasegawa kit, but I assume they would be equally suitable for other brand kits as well. The set has no instructions regarding placement locations, and the header card says “Check References! See AJ Press #17 BF 109 Pt. 2 for Centreline Gun Reference”. Not everyone will have this superb reference, which also happens to be in Polish, and so I feel this is a little bit of a cop out on Loon Model’s part. The lack of information with the set may help achieve a lower price-point, but it doesn’t help those without an appropriate reference. 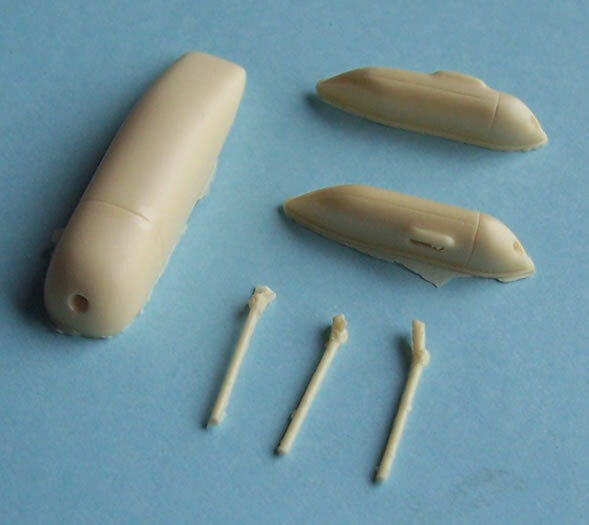 A simple drawing or image relating the parts placement to the Hasegawa kit would suffice. I assume that the AJ Press book formed their reference because I see from my copy that there are some good photos and plans of the gun installation. However Loon models has overlooked to include the small hatches that are on the upper forward part of the pod, despite their being quite clear in the AJ Press photos and plans. The gun pod parts are well cast well enough. Roll Models web-site describes them as being in their “No Cut Series” which I assume means no casting block to remove, but the gun packs have small stubs that need to be removed – not that this matters in the least, along with a bit of flash. The gun barrels are unimpressive for the scale, being little more than resin copies of plastic rod, and need cleaning up and the barrel drilling out. They completely fail to capture the subtle shape variations of the barrels so apparent in the photos of the AJ Press reference Loon Models suggest you refer too. 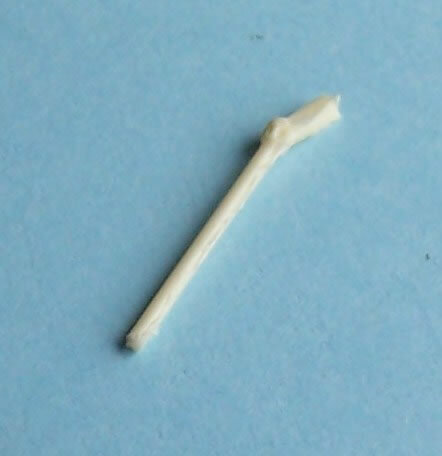 I’ve seen far better resin gun barrels in 1/72 scale. This set offers the opportunity to build a very heavily armed and impressive looking Bf 109G. Relying on modellers having access to an albeit superb Polish publication is no substitute for some simple instructions on gun pod placement. The failure to capture some of the detail so apparent in this reference is a pity, and the gun barrels are sub-standard for the scale. 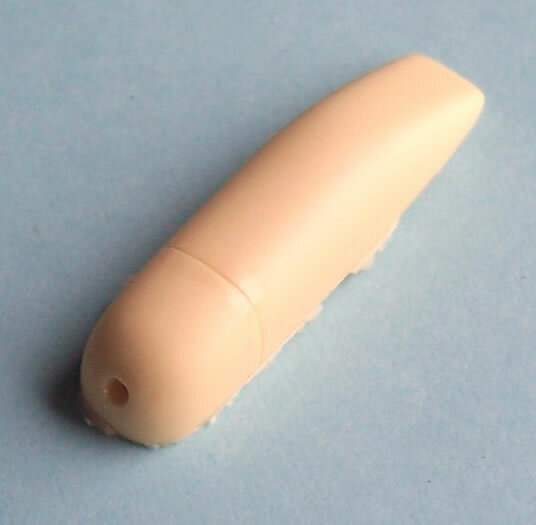 Despite my criticism I can give the conditional recommendation that this set could still be a good basis for the intended conversion, but some substitute gun barrels will need to be made our sourced to get the best result.